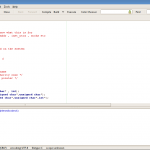 wxwebconnect is a control for wxwidgets that allows to embed a gecko browser in a wxwidgets application. Extract them in home directory. Inside the webconnect directory you would see directories like webconnect , xr and testapp. Once this process is over wxwidgets should be build. 6. Now do a make inside /home/user/webconnect-1.1/testapp. 7. Now everything is compiled. But one this still remains is xulrunner. You need xulrunner 1.9.x . The one available on Mozilla website will not work. So lets do a trick. Install the xulrunner-1.9.2 package from synaptic. It will install all xulrunner files in /usr/lib/xulrunner-1.9.2.17/ or a similar location. Go there and copy everything. First empty the /home/user/webconnect-1.1/xr directory and then paste everything here. 8. Now go inside testapp and execute the testapp binary which we created a while back. It should run and open webpages fine.